A great tour for outdoor enthusiasts, this tour takes you on a 3.5 (6 kilometer) hike through a protected natural area. Watch as the flora and fauna change with the increasing altitude. 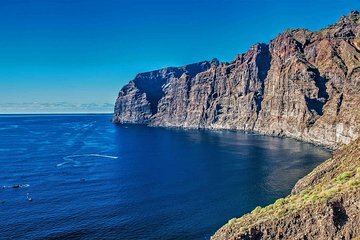 Later, visit Acantilados de Los Gigantes—giant cliffs that rise straight from the sea—then enjoy free time at a nearby beach where you can swim, sunbathe, or simply relax and enjoy the views. Hotel pickup and drop-off in some places North of the island from la Matanza till Puerto de la Cruz 20 eur more per booking, 25 eur per boking Icod, Garachico, Buenavista, Los Silos. We will pick up the clients in their accomodation. In adverse weather conditions, the ravine can be dangerous. The trip may need to be rearranged in this case.